Campaign in Seattle at the Microsoft WinHEC conference. We had a great time with about 20 local Free Software and privacy advocates. 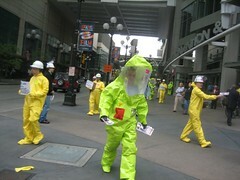 We all dressed up in hazmat suits and handed out leaflets warning of the dangers of DRM to attendees of theWinHEC2006 conference. this around the country, as well as other types of direct action and PR. Now go to DefectiveByDesign.org and sign up for the campaign.